Society | Quasi Daily News - News and Opinions on...everything under the sun! Quasi Daily News – News and Opinions on…everything under the sun! Must-see twenty minute video. Story of Stuff. Why Is This Happening To Me…Again?! Why isn’t this book required reading? The mind, aka “the great deceiver”, let’s us see and experience what we unconsciously believe. In other words, our realities, or perceived realities, are based on our ingrained belief systems. The good news is that we control our own thoughts, and thus can re-program those beliefs and hence our realities. I recommend this book to everyone. It’s an easy, quick, must read. Tomorrow twenty-four states will hold either primaries or caucuses for at least one party. Whatever you do, vote for the presidential candidate that best represents your beliefs. Don’t be swayed by polls, the media, or whether your state is historically considered a blue or red state, or by people telling you that your candidate has no chance of winning. Do not vote for your typical, cookie cutter, status quo politician. Vote for real change, vote for a cultural revolution. Vote for Ron Paul! If you are for peace, for life, against big government, against forced vaccinations, there is only one choice. Ron Paul! The two issues that are perpetually raised, by presidential candidates and the media, are the Iraq War and the Economy. First all all, let’s remember that the U.S. military is not just in Iraq but all over the world, whether fighting an undeclared war or acting as “peace keeper”. Ron Paul will stop the Empire building. As a result, fewer lives will be lost and terrorist threats will decrease, if not stop all together. As far as the economy, the U.S. military is one of the biggest expenses that we have. It’s very simple: no wars = no debt. We could finally balance the budget and put an end to the slumping economy, this just by stop being the bully of the world. Let’s vote for good change, not bad change. We cannot allow another George W. Bush to be put in office. And as a final note, I would encourage everyone to use a paper ballot. That will increase the chances of your vote being counted. Are there any alternatives to the US dollar? ie Federal Reserve Notes? Yes! The realty is that anyone can create new currency. Now, I’m not talking about counterfeiting, what I’m talking about is creating new currency from scratch, whether that be seashells, buttons, salt, labor, time, favors, etc..
One such alternative is LETS. What is a LETS? It’s a community-based, social collaboration network in which goods and services can be traded without the need for printed currency. Similar to barter but not really. I would describe it like barter on drugs, in a good way. Let me explain. In a barter system both parties need to mutually agree to the exchange. That is time consuming. In a LETSystem you offer your products or services to another member of the system and you get credited. Then once you want to buy, you contact a member of your choice, and your account gets debited. The initialism L.E.T.S. could stand for a variety of things, but in the end the practicality is the same: “Local Exchange Trading System”, “Local Economy Trading System”, “Labor Exchange Trading System”. LETS not only promote a sustainable economy, but they are usury-free, inflation-free, and recession proof. Once enough people in a given community have been introduced to this idea, and become actively involved, the hard part is history. Anyone interested in being included in the Chicagoland LETS directory please send an email to (gdeluca17 at comcast dot net) with your name or company, email address, city, and up to five goods and or services that you would offer. We will launch a website once we have a substantial number of people. The website will be a directory of products and services, offered and wanted, searchable by location. Individuals and businesses are welcome. Absolutely free to join. Question: Why is Dennis Kucinich systematically excluded from national debates? Answer: For the same reason that Dr. Ron Paul is excluded from most national polls conducted by the media. The powers that be, are afraid that if we are allowed to listen to their message, good will prevail over evil. The media does their best to condition and passively brainwash us, by feeding us the same garbage 24 hours a day. By systematically pretending that the two best candidates don’t exit, they hope that Americans will just give in and decide to not vote for their “unelectable” candidate, and vote for one of the chosen ones. As we know, the mainstream media is simply a mouthpiece for the corrupt elite that have been running this country for quite some time. CBS, NBC, ABC, Fox, CNN, MSNBC…they are all the same! And, stop reporting on the life and times of Britney Spears, Paris Hilton, and the likes whenever there is a lull in the world of news. There are other networks (MTV, VH1, E!…) that cover those fascinating news. If it’s a slow news day, put up a map of the world so our children learn some geography. Ron Paul is for real change. Good change. Not the “change” that all the other candidates are babbling about. Take a close look at the issues and voting records, and give me a good reason why this man shouldn’t be our next president. So, why is Dr. Paul shunned by the media, big government, and corruptorations? Well, because he is for less government involvement in peoples lives. He is for free markets. Against the war and Empire building. But, the biggest reason is that he wants to eliminate the Federal Reserve and Income Tax. What does our not so distant American history tell us about revolutionists speaking against the mighty Federal Reserve? The independently owned Federal Reserve. The institution that creates money backed by NOTHING! President John F. Kennedy was assassinated because he was going to eliminate the Federal Reserve. Ohio congressman James Traficant is serving an eight year prison term for his Bankruptcy of the United States speech. What’s happening to Ron Paul irritates me, but doesn’t surprise me. In the end Ron Paul and the revolution will prevail. Let’s take back our liberties. The Naples garbage collection saga continues. This is just one of many pictures and videos that are on the internet that show the visual and environmental pollution of the city and surrounding areas. Note that this picture is from June 2007. Garbage strikes are nothing new to this city. For that matter, strikes of any kind, are nothing new to the whole Italian peninsula. 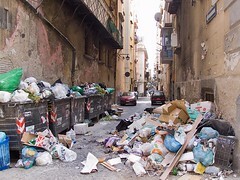 The Naples garbage crisis revives the expression “Vedi Napoli e Poi Muori”…”See Naples and Then Die”. The expression can be taken quite literally if we take a look at the cancer rates in the surrounding areas, and the stench of rot. The current situation is a complete mess. Of course this is not something that happened overnight. It was a problem that was ready to spill at any moment for quite some time, and now it did spill…all over the streets. Who will resolve this mess? Politicians? Citizens? I’m not quite sure, but they better get their act together and stop pointing fingers, before this turns into more of a sanitation nightmare than it already is. My humble, and common sense, suggestions would be for the citizens to start composting their organic waste. Non-organic waste does not emit nasty odors. Stop buying unnecessary things. Reusing materials. Take responsibility for your own actions. And stop the violent-anarchical maneuvers. The situation will be resolved much faster if everyone behaves in a civilized manner. This garbage logistical dilemma is a simple result of ignorance, and over-consumptionism, sprinkled by a “little” corruption via the camorra and some no-good politicians. As we all know we don’t directly vote for the U.S. president or vice president. That duty goes to the electoral college, or the college of electors, as it is known in the Constitution. So hypothetically “candidate A” could receive 100% of the popular vote, but still lose the election. Dear Mr. President and Congresspeople: Stop stalling… it’s time to abolish the electoral college! Amend Article II, Section 1, of the Constitution, and repeal the 12th Amendment. It is an outdated system that has worn out its welcome. In our modern times where transportation and telecommunications are so easily accessible, there is no need to have “electors” vote for us. The Gregorian calendar was imposed on western civilization in the year 1582 by the Papacy, based on the Julian Calendar which was introduced by Julius Caesar in 46 B.C. The Julian calendar was based on the Roman Calendar, which in turn was based on the Greek Lunar Calendars. Jose Arguelles, decoder of the Mayan Calendar, and co-founder of Earth Day, proposes a better alternative to our present Gregorian Calendar. It’s the 13 moon / Dreamspell calendar. Sign the petition for calendar reform. Benazir Bhutto, the two-time prime minister of Pakistan has been assassinated. I am saddened by her death, and the death of the other people involved in the attack. She was a very courageous woman, and I believe that she truly stood for a better world. As for the allegations of corruption, most were fabrications. Her off-shore accounts were real, but who are we to judge the legality and ethics of that. Now, if she stole from the people that’s a whole different story. What does her death mean to us? Well, I’m with Ron Paul on the idea of non-intervention. Each country deals with its own problems, especially if they are in the middle of a civil war. Let’s stop pumping money, money that we don’t have, into foreign economies. Let’s stop supporting dictators…and then changing our minds. When will we learn? In the past we have supported Osama Bin Laden, and Saddam Hussein, with money and weapons. And we know how the rest went. Bottom line: let’s stop supporting Pervez Musharraf. Why? Because he’s another dictator!